Which airline has performed the worst during Vancouver’s recent snowfall? As of 8:00am Wednesday December 24, that answer is an easy one: Air Canada. 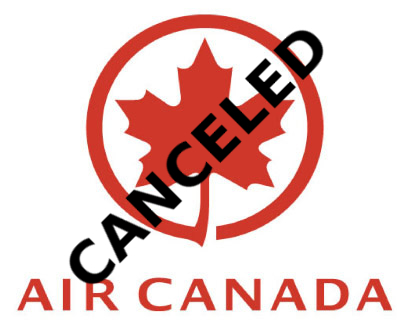 Of 84 canceled flights, 68 were Air Canada (80.95%). By comparison, not a single West Jet flight is listed as canceled at this time. Vancouver’s financial district has long been a barren wasteland for decent bars and restaurants: while several excellent restaurants populate the district for the lunchtime business crowd (Hy’s, Rex, etc.) few bars have existed for evening entertainment (notable exceptions: Smiley’s; Moose’s). That changed recently with the opening of a new Cactus Club in a purpose-built building beside the Bentall V tower. The new Cactus Club is impressive: an enormous patio frames the building; the bar is in an island configuration (thereby maximizing bar space for patrons); the restaurant proper is spacious and huge. In short, the new Cactus Club has all the makings of a great after work and evening hang out. Unfortunately, there’s one big problem with the big new restaurant: the crowd. Instead of the sophisticated, after-work crowd from the financial district one would expect of the new bar, the crowd instead consists almost entirely of Surrey types: crass, loud, superficial and simple. In the heart of the district with the highest disposable income, the biggest expense accounts and the most discerning employees one finds an oasis for the red neck, low income set. Crass superficiality, absent any irony, rules at the new Cactus Club. It’s like being at the Guggenheim and finding an exhibit of preschool crayon drawings better suited carefully tacked behind suburban fridge magnets. As such, we highly recommend an alternate venue, any alternate venue. Nearly impossible deadlines, daily conference calls/meetings and working through the night at least one night in five for three months have made one thing abundantly clear: I need a vacation. And I don’t mean maybe. So it was perfect timing when the excellent Golden Nugget casino in Vegas sent me an invitation: three nights of deluxe accommodation and $300 in slots play or chips, all on the house. All I needed was airfare and I’d be in a four-diamond hotel playing blackjack in no time. Just thinking about it had me feeling more relaxed. Off to the Travelocity site I went, equal parts guilty and giddy: guilty for allowing myself some unproductive days; giddy for allowing myself some unproductive days. 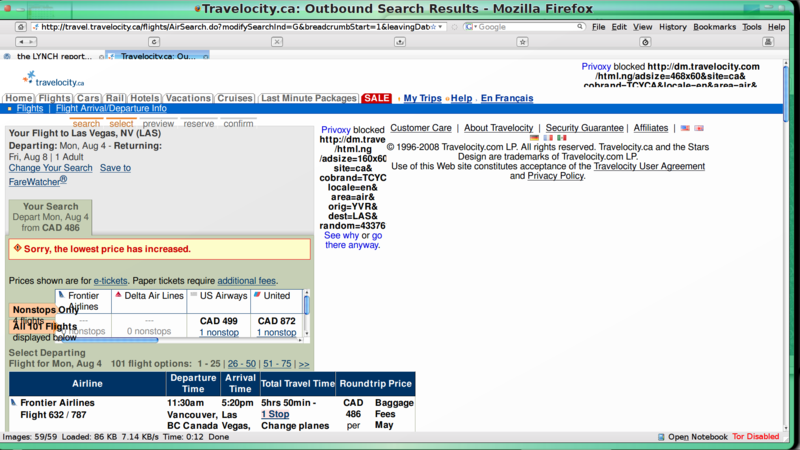 Mild, low-level irritation set in almost immediately: Travelocity doesn’t render very well in Firefox. Oh well, there’s a price to be paid for using a web standards compliant browser. I plugged in my request for a round trip flight to Vegas, selected a departure date of August 3rd and a return date of August 5th, and clicked the big Search Flights button, grinning while the site spent some time thinking about what to offer me. While the Travelocity site did its thinking, I was busy imaging myself playing blackjack poolside: a comped Becks in one hand, a stack of winnings in the other. It’s fair to say I was sliding into a pretty damn fine mood. Four days in Vegas for $449. Immediately above, 5 days for $387. My flights came up, on the dates I wanted, for $449 – considerably more than I paid for a March trip to Sin City, but not bad, given the direction the price of oil has gone since then. 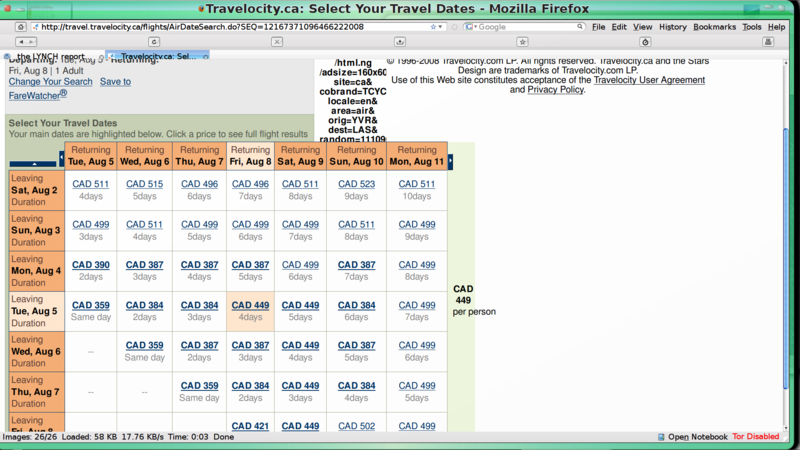 But wait: immediately above the square where my selected dates intersected, the matrix showed I could depart August 4th, stay five days instead of four, and pay just $387! That seemed like the right flight for me! I reached for my wallet, pulled out the credit card I suspected had the most room on it and prepared to book my flight. I selected the $387 flights and continued grinning. That is, until the following page appeared, showing the price had increased to $486 (a 25.58% increase!). Suddenly it wasn’t such a great deal after all. I clicked the back button, and that’s where it got really strange. First the Bait, then the Switch: Price goes from $387 to $486, a 25.58% increase. I decided to see what the prices were for some other dates, so hit the little arrow button above the departure dates column. This shifts the departure dates back by one day. But what was this? Suddenly my original dates of August 5th to August 8th showed a price of $384! Clicking on that option, however, brought up the same, “Sorry, the lowest price has increased” message, and now the price was $452! It turns out the dates you want (ie the exact center of the matrix) always show a higher price, while various surrounding dates show lower prices. That is, until you click them or move the matrix. Then, suddenly, the price changes, and not for the better. SUMMARY: Outstanding hotel rooms not enough to overcome mediocre casino and extremely poor service. Off-site management meetings are always a welcomed change of pace, so when it came time for our latest leadership gathering, we decided to hit the road: a trip stateside to the Tulalip Resort Casino, just outside Everett, in Washington State. These people are hired stand-ins. You will not experience anything approaching such simulated glee at Tulalip Casino Resort. A two-hour drive south from Vancouver, the Tulalip Resort Casino is located immediately off Interstate 5, next to an outlet mall and not much else. The air has a pungent, manure odor to it, unfamiliar to us city types, which thankfully was undetectable once inside the resort. We’ll give you the good news first: the accommodations are first-rate: large rooms with enormous, tastefully decorated bathrooms (complete with separate toilet area, in the old British water closet tradition), big LG LCD flat screen TVs, and some of the most comfortable beds I’ve ever had the pleasure of sleeping on. Access to your floor is governed by key card, room service is available 24 hours a day (and was delicious) and maid service was top-notch and unobtrusive. Some minor quibbles worth mentioning: the entire hotel is non-smoking. This despite the fact one can smoke anywhere on the casino floor. The hotel room windows also don’t open; nor do the rooms come with balconies. Checked in, delighted with the accommodations and patting ourselves on the back, we headed for the casino. On the way into the casino, there’s a lounge. We mention that only to point out a strange feature of this particular lounge: there are no seats or tables to lounge at. The bar features no bar stools whatsoever; the only seating available is at one of the slot machines that occupy every inch of wall space, or at one of the table games in the middle of the room. Wanting to relax a moment and have a drink, we got out of there in a hurry. Instead we found another lounge almost directly across, this one with chairs and tables and servers and all the other things we’ve become accustomed to finding in a lounge in this, the modern age. You can’t smoke in this lounge, although immediately outside the entranceway (which has no doors) you can. Having gotten some business out of the way in the lounge, we headed for the casino floor. If you’ve ever gambled in Vegas or Reno or Vancouver or, really, anywhere else, you’re in for a big disappointment. 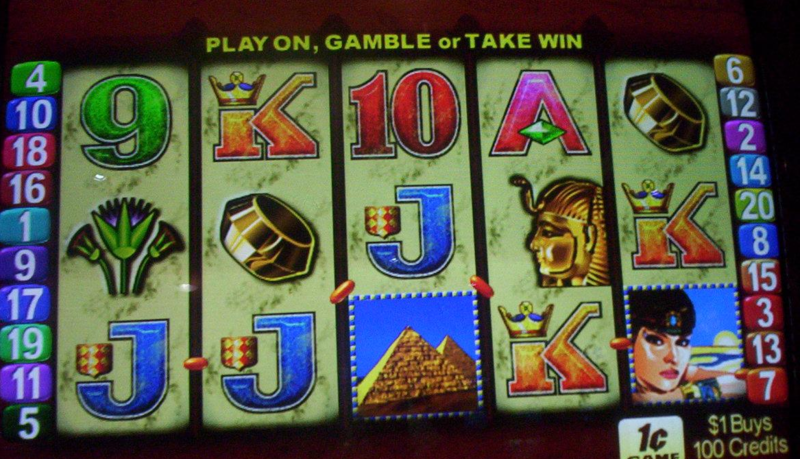 The slot machines are all of the late ’80s mid ’90s variety – you know the kind: lots of “7s” and diamonds and “bar” and not much in the way of bonus games. Put it this way: you’re not going to find a Wizard of Oz machine here. But wait, it gets worse: the slot machines don’t accept money! This we learned after the little slot where one ordinarily inserts money (that is, after all, what we’re here for!) rejected bill after bill after bill. We finally learned that you need to buy vouchers first. There are no signs indicating this on any of the machines. Why on earth a casino would place obstacles in the way of the gamer is beyond us. Well beyond us. Gritting our teeth and repeating, “When in Rome…” over and over again, we made our way to the cashier to get some vouchers. It got even worse when we were confronted with, “What size voucher do you want?” That seemed easy enough to answer: the hundred dollar size! Not so fast. The employee behind the cage was literally asking us the dimensions of the voucher. You see, they have different sized vouchers for different machines, which are incompatible! Also, certain cashiers only accept certain sized vouchers! That’s when we noticed the sporadic signs with, “This Machine Accepts the Big Tickets!” on some slot machines. This was quickly becoming exhausting. With a hundred dollars of the larger vouchers in hand, we made our way to some of the vintage slot machines that populate the casino floor. No worries if the particular machine you want is being used: there are only about eight varieties of machines, and they repeat throughout the casino, everywhere. “Oh look,” we found ourselves saying, “yet another bank of ‘Queen of the Nile’ machines!”. Finally, a cocktail girl appeared. We ordered beers and learned you have to pay for your beers – no comps here. This was getting very tedious indeed. After cashing in our large vouchers for smaller vouchers and trying some machines in the small voucher part of the floor (and finding them equally boring, tedious to operate and frustration inducing), we gave up. The casinos in Vancouver have better atmosphere, modern machines (which, horror of horrors, accept money directly!) and spin when you hit the button telling them to spin. In fact, the worst casinos we’ve ever been to are better than the casino featured at the Tulalip Casino Resort. Frankly, we’d rather sit in the parking lot and bet on who can throw a penny closest to the wall. Fed up with the gaming, we set off in search of food, ending up at the Tulalip Bay fine dining restaurant. This is a place trying very, very hard to exude an air of “upscale”, and they do this by explaining, with great verbosity, every aspect of every item you order, using superlatives they must have found at a bulk sale somewhere. The menu is standard west coast fare, the usual assortment one finds in any number of Vancouver restaurants, usually consisting of a seafood/french cuisine fusion. The wine list is solid, though not spectacular, and God help you if you make the mistake of asking for some advice on a suitable wine. You’ll be there for a long…long…long time. For more standard eating, Tulalip Casino also features Cedars Cafe. We’d like to tell you about the food there, but can’t: we waited an awfully long time to be seated while the hostess gazed down at her seating plan, finally acknowledging us after no less than three minutes (during which we coughed and rattled keys and said, “excuse me” and nearly reached the point of faking a seizure). When finally seated, we waited another twenty minutes. No one came to our table. Parties at other tables craned their necks and made hand gestures and waved menus wildly. Alas, all such displays were ignored. We left after twenty minutes (we timed it) of trying to get some service, any service. Having only recently opened the hotel portion of the property, perhaps the staff at Tulalip are still trying to sort out the basics of customer service. Maybe they hadn’t bargained on the possibility of seven parties in the Cedars Cafe simultaneously (gasp!). Maybe the real slot machines are on order and shall arrive shortly. Maybe the native band which owns Tulalip Casino Resort is unaware their casino resort is competing with casinos everywhere, in a faltering economy, running a gaming monopoly no more. Regardless, we can’t recommend visiting this casino resort unless you don’t care to gamble, bring your own food, don’t smoke and stay in the truly amazing rooms for your entire stay. If it’s gambling you’re after, you’re better off two hours north at the excellent River Rock Casino in British Columbia (added bonus: winnings are not taxed in Canada) or the comparable Boulevard Casino, also in BC. Or simply fly down to Vegas. Having learned our lesson, we’ll be holding our next off-site management meeting somewhere, anywhere, but the Tulalip Casino Resort. Directions: Tulalip Casino Resort is located off I-5 ten minutes north of Everett. Cons: Gaming floor, restaurants, service (at all levels), irritating voucher system, incompatible voucher sizes, terrible variety of slot machines, no drink comps, barriers to enjoyment at nearly every turn. Suitable for: the non-gamer, non-restaurant eater who will not leave hotel room. Final Word: Don’t bother with this mediocre casino resort.